Dr Terence Cheng is Senior Lecturer at the School of Economics at University of Adelaide. A health economist by training, his expertise is in the areas of health care financing and cost, medical labour markets, and health system performance. He has a keen interest in the application of econometric techniques to address research questions with a strong public policy focus. He has published widely in economics and multidisciplinary international peer-reviewed journals. Premiums for private health insurance are expected to increase by an industry average of 4.8 per cent in April this year. This comes on the back of sustained increases in premiums, which have grown at a rate of 1.5 to 3 times higher than the rate of inflation since 2010. This is expected to place further strains on household budgets; indeed there is much mentioned in the media, of individuals and families who have downgraded or discontinued their private health cover. Much of the available evidence pointing to the increasing occurrence of policy downgrades come from data documenting an increase in the number of private health insurance policies that are written with exclusions and/or excesses and co-payments. To shed more light on this issue from a different perspective, let us look at data on households and household expenditure collected in the Household Income and Labour Dynamics in Australia (HILDA) survey. Figure 1 shows how household spending on private health insurance premiums has changed between 2012 and 2013, using two waves of the HILDA survey (data from the survey is released with a lag of roughly two years). From the survey, out of all individuals and families that have private health insurance in 2012, 60 per cent have maintained or increased their spending on premiums in 2013. In contrast, two in five have either reduced their spending (36 per cent) on premiums, or have dropped insurance cover (4 per cent) entirely. There are some differences in how expenditure patterns vary across family types. 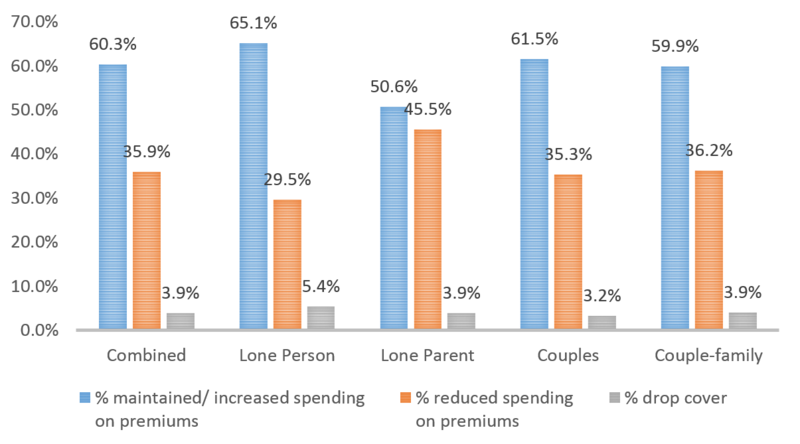 For instance, lone parents are significantly more likely to reduce the amount they spent on premiums compared with singles (lone person in Figure 1), and couples and couple families. Singles, on the other hand, are more likely to drop cover altogether. Let us look at Figure 2 to understand how much spending on premiums has changed. In 2012, the average household spent $2,326 on private health insurance premiums. Those who have maintained or increased their outlay on premiums have spent an average of $763 more per year in 2013 compared with 2012. Those who have spent less on premiums have, on average, spent $718 less. This corresponds approximately to a 30 per cent decrease in expenditure on premiums compared to the year before. 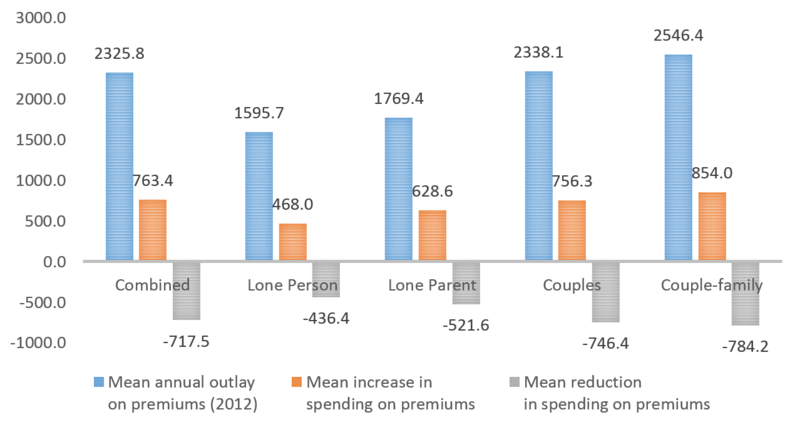 Across different family types, the reduction in spending on premiums, in percentage terms, varies between 27 per cent and 32 per cent, and is lowest for singles and highest for couples. To anticipate the impact of policy downgrades it is useful that we understand the factors that are associated with the probability of downgrading. This is shown in Figure 3. Individuals aged 18 to 30 years and 31 to 64 years are more likely to downgrade compared with older individuals over the age of 65 years. Health status does not appear to be a factor as individuals in good and poor health are roughly equally likely to downgrade. 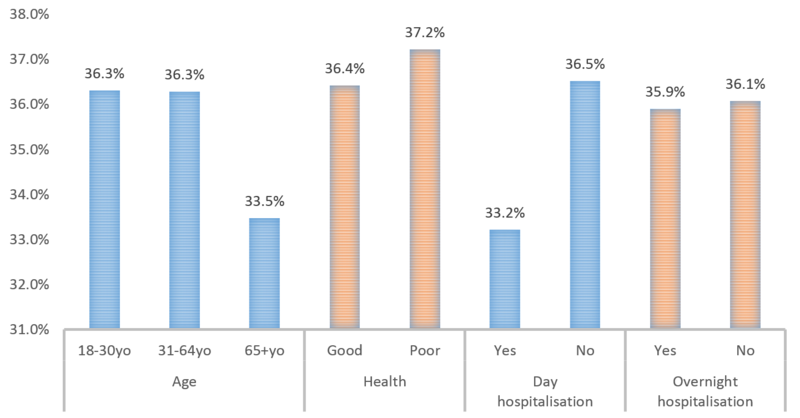 In terms of hospital use, individuals reported to have been hospitalised as a day patient in the 12 months preceding the survey are less likely to downgrade compared with those who were not hospitalised as a day patient. The probability of downgrading does not appear to be associated with whether or not an individual is hospitalised for an overnight episode. What do these cursory evidence tell us about the possible impact of policy downgrades on the private health insurance market? We saw from the data that downgraders are more likely to be younger, and are less likely to have used day hospital services (though not overnight hospital services). If the trend of downgrading continues, this may potentially worsen the problem of increasing premium costs, as healthier consumers (i.e younger) scale back on private health insurance, resulting in a remaining pool of ‘less healthy’ consumers with greater health care needs. Whether or not policy downgrades translate to greater pressures on public hospitals would depend on how changes in insurance coverage affect consumers’ decisions on whether to obtain hospital care from the public or private health sectors. There is, to my knowledge, no evidence on how health care decisions of these individuals have changed and hence it is important to evaluate the impact of downgrading. It is also important to identify the factors driving the persistent growth in premiums that we have experienced. Downgrades however are not necessarily bad. Government incentives, through rebates and the Medicare Levy Surcharge, have distorted consumers’ perceptions on the value of private health insurance, and clouded decisions on whether individuals should insure, and how much insurance to buy. There are both efficiency gains overall, and savings on the part of consumers, if downgrades are a result of consumers re-evaluating and ‘optimising’ their private health cover, by for instance choosing not to be insured for services they do not expect to use. This process necessitates that consumers have the required information, and understand the health insurance plans that are available, to make a fully informed choice. Acknowledgement: This research uses unit record data from the Household, Income and Labour Dynamics in Australia (HILDA) Survey. The HILDA Project was initiated and is funded by the Australian Government Department of Social Services (DSS) and is managed by the Melbourne Institute of Applied Economic and Social Research (Melbourne Institute). The findings and views reported in this paper, however, are those of the author and should not be attributed to either DSS or the Melbourne Institute.